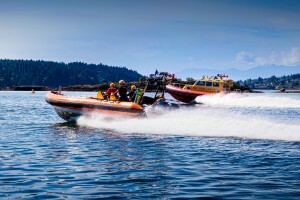 RCM-SAR Station 27 provides marine search and rescue capabilities in the coastal waters around Nanaimo using two dedicated rescue vessels. We provide a fast response to emergencies 24 hours per day, every day of the year through a group of dedicated volunteers. We are an all-volunteer group supported by the Nanaimo Marine Rescue Society, a registered charitable organization, and all our specialized rescue equipment is acquired and maintained through the financial support of the community.